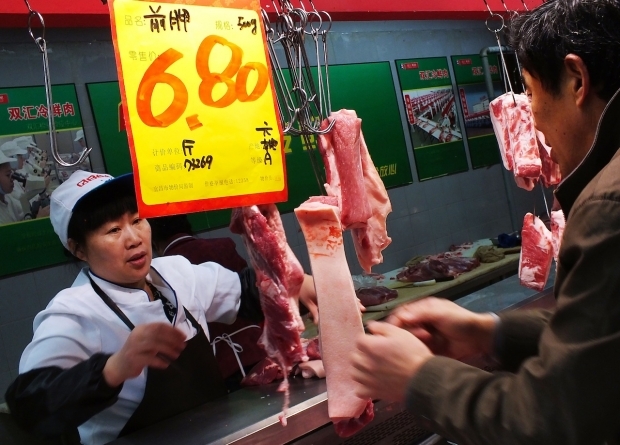 A customer selects pieces of pork supplied by Shuanghui International at a supermarket in Hubei province, May 30, 2013. Last week, senators from both parties finally came together for a common objective: stopping the $4.7 billion sale of America’s largest pork producer to China. Their reason? The sale of Smithfield Farms to a Chinese company, Shuanghui, could pose a threat to America’s critical infrastructure. The Senators wanted the Committee for Investment in the United States (CFIUS) to block the deal under its authority to stop foreign investments that it deems threats to national security. Under the 1975 Executive Order establishing CFIUS, the committee, chaired by the Treasury Department with input from other agencies, can prevent a foreign company from purchasing major U.S. assets if their sale is deemed a major national security concern. At stake is the largest-ever Chinese investment in an American corporation and the future of China’s perception that it has fair access to the U.S. market. The Smithfield Farms deal threatens to undo a lot of good will between the U.S. and China on FDI issues precisely because there is no plausible national security issue in the deal. One Chinese diplomat asked: “How can pork be a national security issue?” The answer, sadly, is only through a political intrusion into the CFIUS process. Though CFIUS gets little public attention, it is slowly driving a major between the U.S. and China. In total, CFIUS handles a very small set of interactional transactions; it has reviewed only 269 deals from any country between 2009 and 2011, with only thirteen deals failing because of an investigation. Though the process affects only a small number of deals, it has an outsize impact on U.S.-China relations because the Chinese have come to view it as a tool for blocking Chinese investments in U.S. markets. The recent set of high-profile cases in which Chinese bids for U.S. assets have been blocked has contributed to a Chinese perception of operating at a disadvantage when investing in the U.S.
What’s the Senate’s Beef with China’s Play for American Pork? Originally designed as a limited means for checking large-scale investment in U.S. national security infrastructure, CFIUS was expanded dramatically after 9/11. President Ford created CFIUS in 1975 at a time when the United States was concerned with OPEC countries attempting to purchase assets critical to U.S. security. As the system developed, the focus was on Japanese investments in the late 1980s, particularly the proposed 1987 sale of a large semiconductor company to Fujitsu. Standards then were relaxed in the 1990s in an era of prosperity and limited concern about foreign threats. The September 11 attacks brought the CFIUS process to the forefront of trade policy. After the attacks, “CFIUS-imposed risk mitigation agreements became significantly more stringent,” notes Stephen Heifetz, a former CFIUS staffer at the Department of Homeland Security. The inclusion of the Department of Homeland Security in the CFIUS process helped to raise scrutiny on new deals and the government’s definition of ‘national security’ expanded. As a result, the mitigation agreements that CFIUS could impose on companies became more intensive. The Dubai Ports scandal in 2006 marked a new era of Congressional intervention in the CFIUS process. The committee approved the sale of a British-owned corporation, Peninsula & Oil Stream Company, which held a series of ports on the coast of New England, to Dubai Ports after careful consideration of the national security concerns. Even though the transaction was the sale of a British company to a an Emerati company, it triggered a CFIUS review because U.S. assets were involved in the transaction. When a foreign company with U.S. assets is purchased by another foreign company, CFIUS has jurisdiction to review the sale of the U.S. assets and can force the new company to divest of its U.S. holdings if a national security concern is raised. A Florida company saw the purchase as a threat and hired a lobbyist to press Congress on the dangers of the deal, and Congressional leaders from both parties saw an opportunity. Congressmen portrayed CFIUS as a secret process and argued that the U.A.E. was a threat to the United States, forcing Dubai Ports to sell its American assets. Subsequently, Congress passed new legislation strengthening CFIUS oversight by forcing a forty-five-day wait limit for any deal under review and requiring that the Treasury Secretary, rather than a lower-ranking official, sign off on any deal. The precedent was clear for foreign investors: Congress always can choose to hold up a deal when it is politically advantageous to do so. Now, as concern about a rising China has reached a fever pitch in American politics, Chinese companies are worried that it may be impossible for them to make significant investments in the United States without a protracted legal battle. “We hear from Chinese clients all the time that the CFIUS process isn’t transparent, which is true, and also that it’s potentially unfair,” says Mark Plotkin, a lawyer at Covington & Burling specializing in national security issues. Without any guidance issued for decision-making and the secretive nature of the process, it can be difficult for Chinese investors to gauge the likelihood of a deal making it through the CFIUS process. With the looming possibility that Congress may get involved, as in the Dubai Ports scandal, investors have to be concerned with the political messaging of a deal. Many argue that a stringent CFIUS process has stemmed Chinese F.D.I. in the United States. Last year, a “series of deals got torpedoed by CFIUS reviews and politicization outside of the formal review process,” noted Thilo Haneman of the Rhodium Group. While the statistics for 2012 haven’t been released yet, there have been a number of high-profile purchases from China that have come under a lot of scrutiny. The sale of Hawker Beechcraft, an aviation company that went into bankruptcy, was killed. The Obama administration stopped the purchase of four wind farms by Chinese companies. One Chinese company, seeking to purchase a wind farm, went so far as to sue the Obama administration for a lack of due process in the CFIUS process. Though the lawsuit is unlikely to go anywhere, it reflects the general frustration about the CFIUS process among Chinese investors. Increasingly, the CFIUS process is becoming a topic of concern for the Chinese government. After a Chinese company, Huawei, attempted to purchase a computer company and was rejected in 2011, the Chinese government stated, “the acquisition of 3Leaf's technology assets is a normal business activity of Huawei based on the principles of market economy and its own development needs, and we regret the case result.” While Huaewei was a problematic case because of its close ties to the Chinese government and the sensitivity of telecommunications investments, the case signaled to Chinese companies that even small purchases (this was under $2 million) could be caught up in CFIUS reviews. Many perceive the Chinese government’s tightening of its own review of foreign direct investment as a response to the tough CFIUS review. Similarly, the soaring Chinese foreign direct investment in Europe, where nations do not have a review as stringent as CFIUS, has been seen as a product of the comparative ease with which Chinese investors may purchase European assets. The concern about the national security implications of Chinese investment won’t be going away anytime soon. With rising tensions over cyber-espionage, and its potential relation to Chinese purchase of U.S. tech companies, any purchase of U.S. technology is likely to come under tough scrutiny. Under careful review, it is apparent that the CFIUS process is not targeting Chinese investment but it is heightening its scrutiny of technology-related deals, which tend to be popular amongst Chinese investors. Nonetheless, Chinese investors remain concerned about CFIUS and the potential for Congressional intervention even after a deal is approved. In large part, the problem is not the CFIUS process itself, Chinese perception of how the process is working. As Thilo Haneman and Dan Rosen of the Rhodium Group have noted, Chinese investments tend to be targeted when they pose high espionage risks, such as a wind farm adjacent to a military base. This is a legitimate reason for screening out an investment but because there is no written explanation of a CFIUS decision, the perception in China is that deals are being rejected simply because of an anti-Chinese bias in the system. A 2013 study by the China Daily with APCO noted that 67% of Chinese executives see anti-China bias as a challenge to doing business with the United States. While the CFIUS process is not anti-Chinese, its opacity is not conducive to the kind of transparency that investors need to make informed decisions. The Smithfield Farms deal tests whether Congress will take a more active and politicized role in the CFIUS process. Smithfield’s CEO, Larry Pope, has gone to Congress to defend the deal and argued that there is no threat to U.S. food security because pork will be exported from the U.S., not imported from China. If Congress intervenes, as it did in the Dubai Ports scandal, Congress will send a “tough-on-China” message to voters but also may push Chinese investors away from large deals with the United States. While there are, of course, legitimate concerns about Chinese foreign direct investment in the United States, the lack of any clear, transparent process in CFIUS and the potential for congressional intervention is going to continue to undermine the U.S.-China economic relationship. If the Smithfield Farms deal falls through, it may take years to repair the damage to how Chinese investors view their ability to access the U.S. market.